Is There a Link Between Grapefruit & Stomach Problems? Cinnamon is a spice commonly used in many baked goods, oatmeal and hot beverages. Made of the dried bark of a tree, cinnamon has been used for thousands of years. Unfortunately, cinnamon may cause unpleasant symptoms in some people. If you often suffer from headaches or experience other health issues after consuming a food or beverage containing cinnamon, you may be intolerant to the salicylates it contains. Salicylates belong to the family of natural food chemical and are found not only in spices such as cinnamon but in many other herbs, fruits, vegetables, nuts as well as in teas, coffees and honey. Aspirin or acetyl salicylic acid is a common pain reliever that's another member of the salicylate family. If you are intolerant to salicylates, these compounds can trigger an adverse reaction within one to two hours and can last for several hours up to a few days. The more salicylates you consume, the more intense your symptoms can be. Headache is one of the common symptoms induced by the consumption of salicylates if you are sensitive to them. 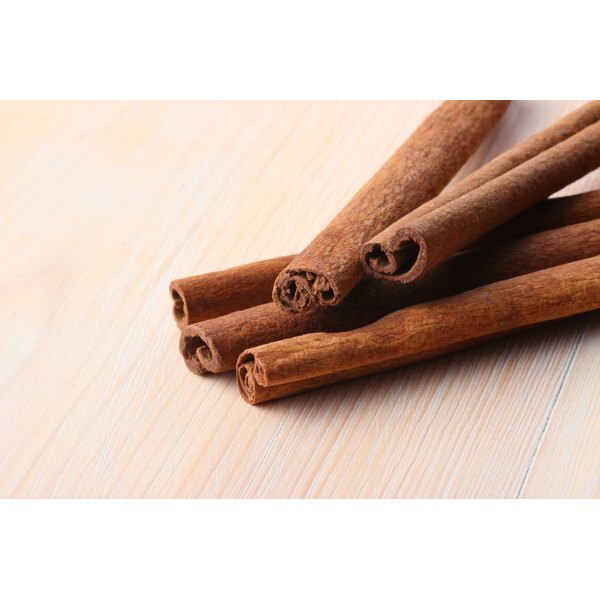 In addition to suffering from headaches and migraines after consuming cinnamon, it is also possible to experience hives, swellings, pain and gastrointestinal problems. Symptoms vary from one person to another, and the only way to prevent headaches is to minimize your consumption of salicylates. You can avoid headaches by controlling your intake of salicylate-containing foods. If you enjoy the taste of cinnamon, you don't have to entirely give it up, but you will need to make sure you do not consume a large amount of salicylates from other foods, such as other herbs and spices, coffees, teas and specific fruits and vegetables, on the days you wish to consume this tasty spice. Consult a registered dietitian for help identifying other sources of salicylates in your diet and designing a meal plan that will allow you to enjoy your favorite foods without suffering from headaches or migraines. Taking aspirin, or acetyl salicylic acid, when you have a headache following the consumption of cinnamon can worsen your symptoms if you are sensitive to salicylates. Consult your doctor or pharmacist and mention that you are sensitive to salicylates. He will be able to recommend more effective ways to deal with your headaches when you consume too much salicylate.